It will generally take less than 24 hours. Selling a toy collection? Message me. Tech Condition: This item comes as shown. Rated a 60 with some wear. My grading scale is 1 - 100 with mint flawless a 100, near mint a 95, excellent a 90 and so on. This item is an authentic vintage Hasbro item. This item is not a fake, bootleg, reissue, remake or encore. Selling a toy collection? Message me. Condition: Sealed and comes as shown. I also have this card as a single along with all the singles for sale. I also trade. Thank you. Transformers G1 Diaclone Red Bluestreak/ Hotstreak with custom box!!! Hello, Up for sale is a custom g1 Diaclone Red version of Bluestreak called Hotstreak In custom g1 style box. Hotstreak is tbe pre veesion of Bluestreak in my Tramsformers universe. The paint job is so good you would think it was originally made this color. A really great piece to add to ones collection. Any questions feel free to ask. 1984 Bluestreak Pre Rub Complete. Toy is complete and in good shape. Broken into three sections as shown, however the roof/head piece is still intact. Figure is as pictured. Missing pieces. Transformers G1 Vintage Metroplex Autobot City Base Decepticon Autobot Hasbro. Condition is Used. Shipped with USPS Priority Mail. Selling a toy collection? Message me. Box Condition: All the inner flaps and side flaps are intact as well nothing is cut from the bottom. I will let the pictures describe the box. Box has light wear. There will be no surprises on the sides or bottom. Figure Condition: (note 2 tires had cracking I replaced them with 2 new tires after the photo) Rated an 85 with light wear. My grading scale is 1 - 100 with mint flawless items a 100, near mint items a 95, excellent items a 90 and so on. This item is an authentic vintage Hasbro item. This item is not a fake, bootleg, reissue, remake or encore. Comes as shown. Sticker Condition: Some have some wear Accessory Condition: 100% complete with all accessories, they are rated a 90. Joint Condition: Semi-tight overall arms have some looseness Paperwork: Includes all paperwork shown. Selling a toy collection? Message me. Manual Condition: This item comes as shown. Rated a 90 with light wear. My grading scale is 1 - 100 with mint flawless a 100, near mint a 95, excellent a 90 and so on. This item is an authentic vintage Hasbro item. This item is not a fake, bootleg, reissue, remake or encore. You get the exact item pictured, as pictured. I try to take good pictures and be detailed so as not to be misleading in the ads. Transformers Original G1 BLUESTREAK 1984 Autobot Car Nearly Complete. I think I was trying to change the color entirely. One missile of 3 included. Two missing. Bluestreak remains in like new condition. GENERATIONS - LEGENDS GDO. He has good joints. He shows light sticker wear. He is complete with all of his accessories. Signature Confimation will be required. Are you wanting to get the most for what you found or don't want any longer?. 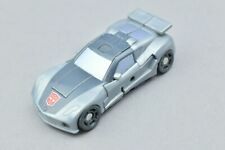 Listing is for a Transformers Generations GDO Bluestreak. He’s new in package. I combine shipping and ship international so please view my other listings for more great items! He shows light wear. We Buy Toy Collections! Scroll down for larger pics. No exceptions. Bluestreak Prowl Smokescreen Rifle Gun. We have lots of other 80's TOYS and other carded, boxed, sealed 80's toys available! "Your collectible toy source.Planet Force! PLANET FORCE. •Part is original and in good shape. Selling a toy collection? Message me. Accessory Condition: Rated a 90 with light wear. It is not broken. My grading scale is 1 - 100 with mint flawless a 100, near mint a 95, excellent a 90 and so on. This item is an authentic original vintage Hasbro item. This item is not a fake, bootleg, reissue, remake or encore. Comes as shown. This is complete with all 75 pieces and directions. Boxes shows wear and creasing. Top of box is ripped on both sides still holds form nice and displays great. Tape on bottom of box and top edge. Selling a toy collection? Message me. Figure Condition: Rated an 80 with some wear. It is not broken. My grading scale is 1 - 100 with mint flawless a 100, near mint a 95, excellent a 90 and so on. This item is an authentic original vintage Hasbro item. This item is not a fake, bootleg, reissue, remake or encore. Comes as shown. Sticker Condition: A few have some wear Accessories: 100% complete with all accessories, they are rated a 90 Joint Condition: Semi-tight. An Autobot Blaster Lot with 2 Boxes & Bubbles. Only the left one has the gun other two are as seen. Stickers have been applied and are in great shape with a little worn on a few check photos. The Original bubbles have thus separated from the backer cards. Selling a toy collection? Message me. Figure Condition: Rated a 60 with some wear, the windshield is slight bent to the back right, but it isn't cracked or broken. My grading scale is 1 - 100 with mint flawless a 100, near mint a 95, excellent a 90 and so on. This item is an authentic original vintage Hasbro item. This item is not a fake, bootleg, reissue, remake or encore. Comes as shown. Stickers: Show wear Accessories: None Joints: Some are loose. Selling a toy collection? Message me. Figure Condition: Comes with sticker packet. Rated an 88 with light wear. It is not broken. My grading scale is 1 - 100 with mint flawless a 100, near mint a 95, excellent a 90 and so on. This item is an authentic original vintage Hasbro item. This item is not a fake, bootleg, reissue, remake or encore. Comes as shown. Sticker Condition: On sheet Accessories: 100% complete and they are rated a 90 with light wear Joint Condition: Tight. Transformers TRU Exclusive MP-06 Masterpiece Autobot Gunner Bluestreak! But you can get one here, sealed inside an unopened box! Their war! Our world! He has good joints. Are you wanting to get the most for what you found or don't want any longer?. I don't like to wait and you shouldn't either. Asia exclusive to Toys R Us. I DO answer them within 48 Hours. But I do have a life other then the internet and another job. Skill Level 1 about 3" long in vehicle mode. I have maybe close to 1,000 . Selling a toy collection? Message me. Box Condition: All the inner flaps and side flaps are intact as well nothing is cut from the bottom. I will let the pictures describe the box, as can be seen in nice condition, save the masking tape on the top flap. There will be no surprises on the bottom. Figure Condition: Rated an 85 with light wear. This item was from a smoking home, but is not faded. My grading scale is 1 - 100 with mint flawless items a 100, near mint items a 95, excellent items a 90 and so on. This item is an authentic vintage Hasbro item. This item is not a fake, bootleg, reissue, remake or encore. Comes as shown. Sticker Condition: Rated an 80 Accessory Condition: 100% complete with all accessories, they are rated an 85 (launchers have oxidation on the screws). It is 14.5" and is dated 2008. Its in good used condition with wear. This is a very cool Star Wars BOX! COIN CANNON ONLY. If you're not happy - we'll do whatever we can to make you smile! We're honest folks, and we want your new toys to make you happy! If we've made a mistake - we'll make it right. Item is in fine condition as shown in the pictures.